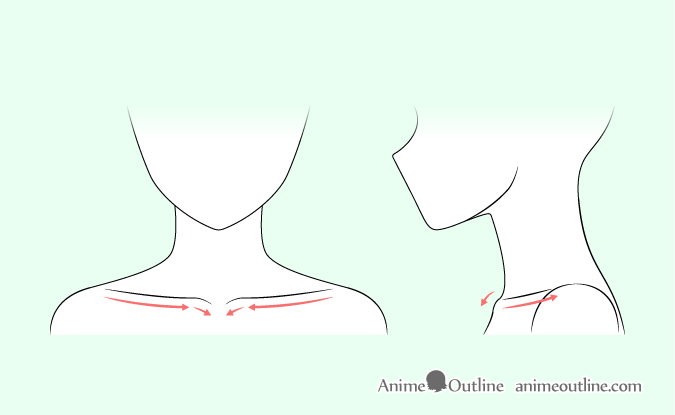 This is a fairly quick and simple tutorial explains how to draw an anime or manga style neck, shoulders and collar bones. 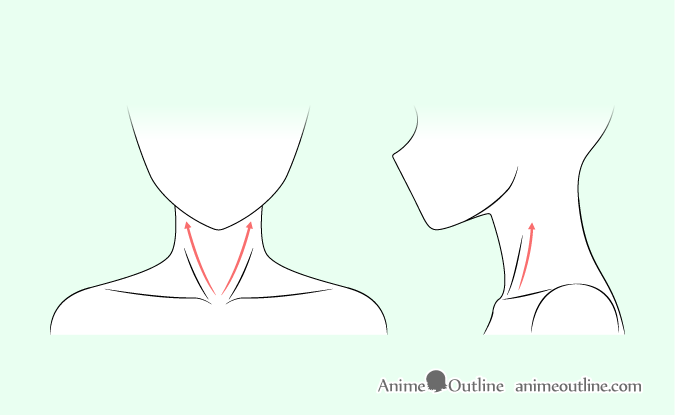 Anime necks are usually more slender than real necks (especially for female characters). Generally the more stylized the anime character the thinner the necks get in comparison to the head. There are some exceptions to this when it comes to very muscular anime characters. 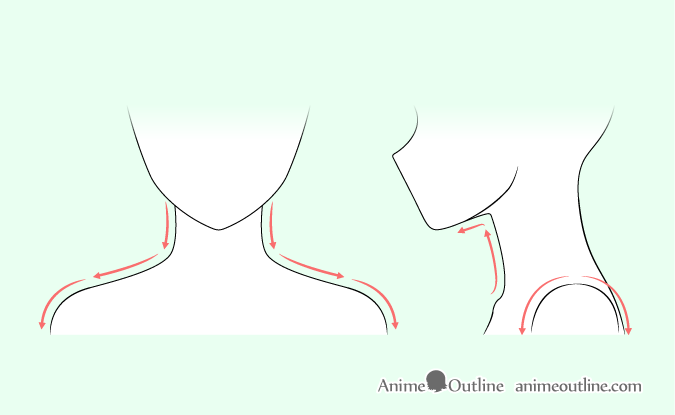 These can sometimes have far bigger and thicker necks than in reality but in this tutorial we will focus on the most common type of anime necks and shoulders. You can draw the neck slightly thinner at the top widening as it goes down (though sometimes anime necks are simply drawn with the same width throughout. Going from the neck to the shoulders are the trapezius muscles. Make sure to draw these with a downwards slope. You can ignore them for the side view when drawing in a style similar to the example. Also for the side view be aware that in the neck is tilted forward though in more stylized anime characters this may no always be the case. Draw the shoulders close to a quarter circle in the front view and close to a half circle in the side view. 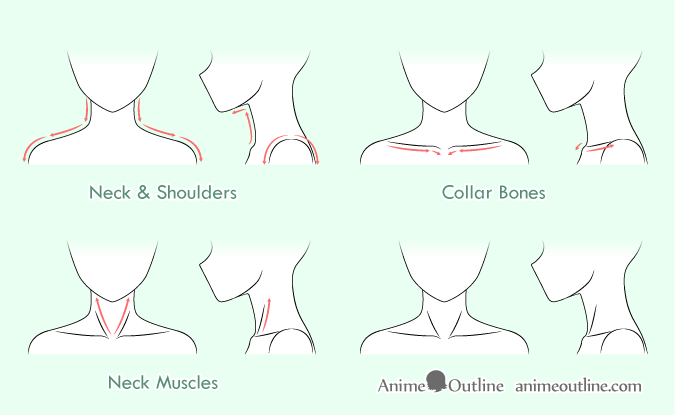 In anime the collar bones are sometimes not shown at all but are more likely to be shown in close up scenes. Draw the collar bones starting close to where the shoulder ends and the trapezius muscles (mentioned earlier) begins. Draw them going down towards the middle of the chest and angling down even more near the middle of the body. In the side view you can draw a sloped line that ends with light bump to indicate a collar bone. The neck muscles that are sometimes shown in anime are the sternocleidomastoid muscles or SCM for short. The SCM go from the middle of the collar bones to behind the ears. When drawing the SCM in the anime style you do not need to show them completely. You can simply give a hint of them by drawing lines that represent their outer edges and go about halfway up the neck. Drawing the common type of neck and shoulders for anime characters is not too complicated. A lot depends on how much you want to simplify your drawing. Very detailed drawings can be closer to real necks and shoulders and very simplified drawings can omit most of the details like the muscles and collar bones all together.